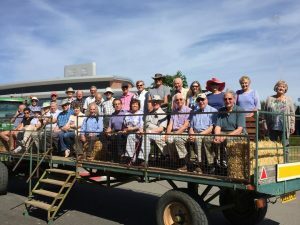 All aboard for a tour of the fields. 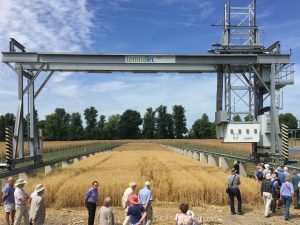 The experimental station’s research program has four main areas: increasing wheat productivity, optimising carbon capture by grasslands, designing seeds and delivering sustainable systems. 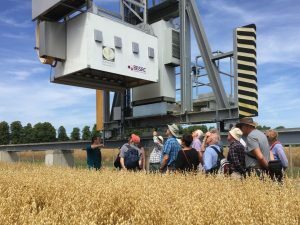 Members take a look at the Field Scanalyzer. This is comprises a gantry that supports a motorised measuring platform with multiple sensors. Crops within a 15m x 120m area can be monitored throughout the season with a high degree of resolution and reproducibility. A Research Assistant explains how the Field Scanalyzer works. The facility is fully automated and can operate 24 hours a day throughout the year. On board there are illumination, facilities for data collection and sensors for simultaneous and non-destructive analyses of plant growth.